Background: Mycobacterium tuberculosis (Mtb) is considered as one of the most efficacious human pathogens. The global mortality rate of TB stands at approximately 2 million, while about 8 to 10 million active new cases are documented yearly. It is, therefore, a priority to develop vaccines that will prevent active TB. The vaccines currently used for the management of TB can only proffer a certain level of protection against meningitis, TB, and other forms of disseminated TB in children; however, their effectiveness against pulmonary TB varies and cannot provide life-long protective immunity. 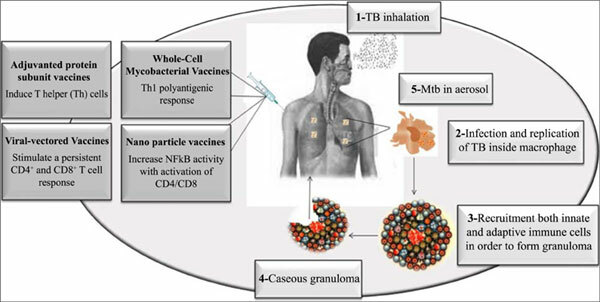 Based on these reasons, more efforts are channeled towards the development of new TB vaccines. During the development of TB vaccines, a major challenge has always been the lack of diversity in both the antigens contained in TB vaccines and the immune responses of the TB sufferers. Current efforts are channeled on widening both the range of antigens selection and the range of immune response elicited by the vaccines. The past two decades witnessed a significant progress in the development of TB vaccines; some of the discovered TB vaccines have recently even completed the third phase (phase III) of a clinical trial. Objective: The objectives of this article are to discuss the recent progress in the development of new vaccines against TB; to provide an insight on the mechanism of vaccine-mediated specific immune response stimulation, and to debate on the interaction between vaccines and global interventions to end TB. Vaccine, Mycobacterium tuberculosis, immune response, clinical trials, public health, End TB.